JAMES WARREN. ANDY DAVIS. CRUN WALTER. 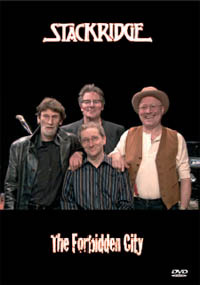 STACKRIDGE performed to a sold out audience in Bath, England during April 2007 as part of their commitment to touring the UK during this year. Angel Air were there to film this historic gig. With 25 tracks and a running time of 150 minutes this is a 'bang up' DVD that should be in everyone's collection. Stackridge needs to be better appreciated, and I can assure you that if I ever discover them appearing locally I will be buying tickets (unless I can get in for free with press credentials hahaha). I am so impressed with this band that I do plan on seeking out some of their other albums. So if the Stackridge PR people are reading this, drop me a line!